TRENTON, N.J. (CNS) — Two years ago, as terminally ill 29-year-old Brittany Maynard made national news by publicly advocating for her right to end her life under Oregon’s Death With Dignity law, Sarah Steele sat in her Camden County home, quietly anguishing over her right to live. “I felt like it really minimized what I had fought for and conquered in my own life,” said Steele, 44, who 10 years ago was told she had only months to live. That’s one reason why Steele, a two-time cancer survivor, wife and mother of three, is now working with a broad-based coalition including the New Jersey Catholic Conference, diocesan leaders throughout the state, and several right-to-life and disabilities advocacy groups against legislation in the state Legislature that would legalize assisted suicide. 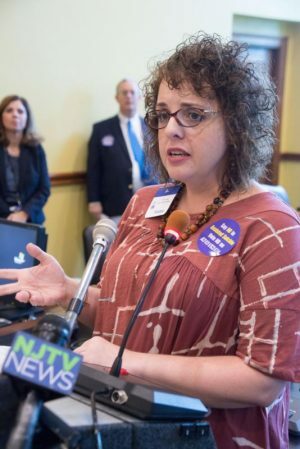 Known as the “Aid in Dying for the Terminally Ill Act,” the bill would permit terminally ill patients to “self-administer medications to end life in a humane and dignified manner.” The state Assembly passed the measure Oct. 20 in a 41-28 vote, with five abstentions, and it now goes to the state Senate. A similar measure is currently pending in the D.C. Council, and Colorado voters will decide if assisted suicide should be allowed in their state. Currently, assisted suicide is legal in five states: Vermont, Montana, Oregon, Washington and California. She was 23 when she was first diagnosed with cancer — stage 3 lymphoma — and told she would never have children. But after years of treatments, she was considered in remission. She also was the mother of two little girls and a boy. Her energy level dropped, and she was diagnosed with post-partum depression. Then the headaches began. Eventually, the pressure in Steele’s brain became so intense, she ended up in the emergency room, an experience she talks about with disdain. She was rushed to Thomas Jefferson University Hospital in Philadelphia, and as she and her family awaited the results of a biopsy, she remembers feeling relieved, not from the news, but to finally have a concrete diagnosis. “We were celebrating that I had an answer … we were almost giddy,” she said. A euphoria that was short-lived as the diagnosis returned — anaplastic astrocytoma, a rare, aggressive stage 3 brain cancer. She underwent two surgeries soon after, but was told she would not see Christmas, which was only four months away. Those months of chemotherapy and medications turned into years of treatment -– years that as she fought for life, she saw her children grow into teenagers. Now, 10 years later, she is stable, but the tumor is still present in her brain, and she is considered terminal. But she’s alive. Steele admits to being frustrated at the overwhelming media attention that surrounded the Maynard case. She said that at the time, she, too, attempted to reach out to media outlets and advocate for the right to live. She got nowhere. Meanwhile Maynard, who was also diagnosed with terminal brain cancer, ended her life in November 2014 with the aid of medication. “What my concern about assisted suicide is, it’s a slippery slope,” she said. “My decision to live doesn’t have an effect on others, unlike Brittany’s decision to die,” she said, expressing concerns over health insurance. For example, Steele cited the case of a 64-year-old woman in Oregon, who, in 2008, was denied medical insurance coverage to treat her lung cancer. The insurance company, however, did agree to pay for a physician-assisted death. For her, the struggle to protect her right to live is still just as dire as it was 10 years ago when she was first diagnosed. “I was told I wouldn’t see Christmas. But it’s not over. Do you know how many Christmases I’ve seen?” she said. Steele, who continues to be treated by Dr. Jon Glass, Thomas Jefferson University Hospital, admits there will likely be a time in the future when her tumor will again need treatment. Mauro is associate editor of The Monitor, newspaper of the Diocese of Trenton. Sarah, you have every right to make the decision regarding assisted suicide for you own life. I would never say that your decision was wrong for you. However, I do not want you to make this kind of a decision for me.